Reprinted from my article in The Spruce Pets. 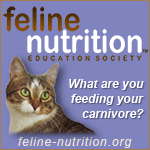 Cats may eat litter—and other undesirable materials—for a variety of reasons. This behavior is referred to as pica, the eating of non-food items. Continue reading at The Spruce Pets. Is your cat’s litter box stressing him out? Published in FearFreeHappyHomes.com Jan. 14, 2019. A mantra for cat caretakers: You can’t scoop the litter box too often. While there’s a litany of tips for successful litter box training, if the box isn’t scooped often, the prettiest setup is useless. Cats have extremely sensitive noses, and while they find comfort in familiar scents, a box full of urine clumps and poop is guaranteed to be off-putting. Not only is it smelly, it translates into stepping among feline land mines. Pulitzer was my problem child when it came to using the litter box. He had a mild case of cerebellar hypoplasia and was a bit of a doofus. As a result, his litter box habits were erratic, but with vigilance we managed the problem. He was my biggest lesson in the importance of maintaining a clean litter box. A video circulated around the internet of a little girl leading her kitten through an agility course in her backyard. The girl’s energy and the tails-up, fearless enthusiasm of Suki, the kitten, were endearing. For most of our cats, their best sport is competitive napping. But the Suki video shows that cats can indeed be trained and love it. Cats need a job, and agility training is just that. Not only does it build confidence, it also encourages them to hone their natural athletic skills. A happy ending! See the update! Panda needs a quiet home as an only cat. Her guardians have gone to great lengths to resolve her dislike of the two other cats in her household, but Panda is very unhappy. Her mom says she is extremely affectionate. However, she’s clearly miserable in her living situation, which she shows by not using her litter box regularly; medication is no longer working. Mom Emma, the Jesus kittens, and Dad River. When you work with two different breeds of cats, this is what may happen. Kaisa Savolainen of Tartu, Estonia, breeds Norwegian Forest Cats and Russian Blues. They’re as different you can imagine: Large fluffy brown tabbies vs. sleek blue, silver tipped beauties. Fearless Kittens: Are They Made or Born? This article was originally published on the Fear Free Happy Homes website. It’s a little bit of both. These tips can help you choose the one who’s just right for you. Stories abound about kittens who are adopted into new homes, then promptly disappear for days at a time, coming out only at night to eat and use the litter box. It doesn’t have to be that way. Here’s how to improve your chances of bringing home a confident, outgoing kitten who will be comfortable in any home or situation. Read the rest of the story on the Fear Free Happy Homes website. The image of a typical cat groomer is one of an aproned individual, armed with combs and clippers and a compliant kitty on the table. When was your cat’s last checkup? Welcome Stormy. And Good bye. Stormy in her new home. After I lost Celica Blue, I was ambivalent about adopting another cat. Losing her had taken the stuffing out of me, emotionally and financially. We love all our cats, but there are those who wind themselves around your heartstrings; Celica Blue was one of those cats. Branford Compassion Club Turns 20! Twenty years after its founding by Eunice Lasala, Friskie Wheeler, and Ann Marie Lorello, the Branford Compassion Club has grown from a group of dedicated volunteers feeding feral colonies to a full service brick and mortar adoption facility. That facility, officially the Branford Compassion Club Feline Rescue and Adoption Center, now has a full-time shelter manager, Pat Cotton, who oversees the daily care and vetting of all the felines who set paws through the doors. Since opening more than six years ago, close to 1,500 felines have found their forever homes, and approximately 2,000 total since 2008. Cotton is backed up by a team of 50 to 60 volunteers who cover all shifts within the shelter. Another 30 or so help with non-shelter related work such as publicity and fundraising.